Let’s say you’re the proud owner of an amazing attraction, venue, or destination. You’ve got a real-life tangible location, and you want people to visit it. The reality is that the people who make up your target audience aren’t going to travel to your destination for the sake of it; they want to come and experience whatever it is that your location can offer them. Whether this is the thrill of riding on the country’s largest rollercoaster or the relaxing atmosphere of a Tuscan villa, the principal remains the same: your consumer wants to feel something, and it’s up to you to make them want to experience that feeling. Because of this, it makes sense that your marketing efforts are geared towards promoting this feeling more so than the physical elements of your location, and we’re going to show you the best way to make that happen. 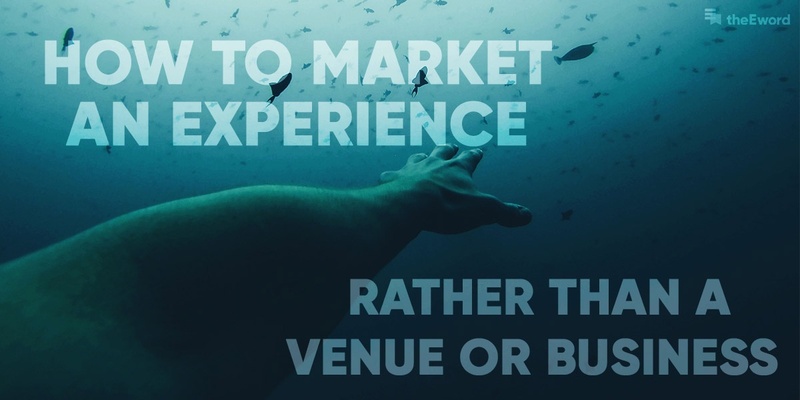 The first step in marketing your experience is to work out what makes it so enjoyable for your consumers, and this usually boils down to the feelings that it provokes. Now, emotional responses are completely subjective and can be quite difficult to predict, but knowing both your product and your target customers inside-out will give you a good understanding of how they respond to your business – and once you’ve established this, you have your USP ready to put into action. Using feelings to sell a product is a tactic that brands have used since the early days of advertising. You pair your brand with the feeling of happiness, sadness, or even fear, and that emotion prompts your target audience to purchase whatever it is you’re selling – it’s a tried-and-tested method. You’re at an advantage when you’re not selling a tangible product, because the feeling that you’re promoting hasn’t just been plucked out of thin air by your marketing department (let’s be honest, Coca-Cola is nice but it doesn’t make you feel that overwhelming sense of joy like the advert implies, does it?). It’s a real emotional response that your consumer is going to feel when they visit your attraction. Whether your target audience is a thrillseeker or a culture-lover, you should incorporate the appropriate feeling into your strategy and use it to inspire any content that you create. The emotions that you choose to tie to the experience should not only reflect what your audience will feel during it, but also how they will feel afterwards. If you can convince them that they are going to feel satisfied, you’re paving the way for repeat business in the future. We’re not saying that you shouldn’t tell them how it’s going to make them feel, but providing visuals that show what to expect from the experience will provoke a stronger reaction. In fact, we recently carried out a study with Manchester Metropolitan University, which found that users engage more with social posts that include images than those without. The type of visual content that you use is also highly dependent on your target audience, because different demographics react differently to various forms of media. For example, if your market research shows that your audience is made up of young mobile users, video content will be one of the most valuable tools that you have in communicating your message, because 51% of all video-plays occur on mobile devices. One of the best ways to build awareness of your experience is by getting people to share content about your brand. If you do this part properly, you’ll find that every piece of content relating to your experience will capture the emotion that is associated with it – whether the content has been created by you or by somebody else. It’s not enough to just make a visual social ad that tells your audience about your experience. Yes, people will engage with it, but it won’t necessarily be shareable content. You have to make content that’s worth sharing both through social and by word of mouth, because you can only put so much budget behind paid advertising before you have to stop. Shareable content tends to take a life of its own, and it spreads to your target audience much faster through mutual connections, so it’s worth getting creative when you decide how to convey your message. When you do begin to generate footfall to your location, let the experience speak for itself. Encourage your visitors to create content to share online by running user-generated content (UGC) campaigns. Statistics show that 88% of consumers trust online reviews just as much as they trust recommendations from friends, so by getting your audience to express a positive emotion in relation to your business, you’ll create strong perceptions of the experience. It’s hard-wired into the human psyche to engage with stories. Stories have the power to simplify difficult concepts, get messages across, and inspire their readers/listeners, which is what makes storytelling such a powerful tool when marketing an experience. The story that you tell will depend on your business. If your audience will be interested in how your experience came about, you can tell a personal story that captures the feelings involved with the destination. Or you can go one better, and get your consumers to tell your story for you: by running competitions on social media and following up with email campaigns, you can build a strong name for your brand on platforms such as TripAdvisor and Trustpilot. Alternatively, you can use storytelling in a more abstract sense to express the emotions that your consumers will feel when they visit your location – storytelling that is particularly strong will provoke a sense of empathy within the audience, and will inspire them to experience your offering for themselves. With consumers placing more and more trust in what other people have to say about a brand, influencer marketing is becoming a key tactic in expressing the emotional benefits of visiting a destination. It’s just a case of finding the right influencer – one who has access to your target audience – and letting them experience your brand for themselves. If you need to market your experience but you’re not too sure how to do it, download our Destination Marketing Guide to learn from our award-winning digital strategies.